Specially designed to cater for a family and for a use with special access considerations. 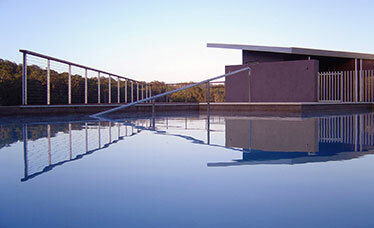 The pool features wide steps into the water with a handrail down the centre, a 1 metre wide water blade spilling into the pool through a hardwood clad wall concealing the pools thermal cover, the hardwood deck adjacent covers a 90,000 litre concrete water tank. Below the water line is a quartzon finish with a mix of local hardwood and stone paving around the pool. 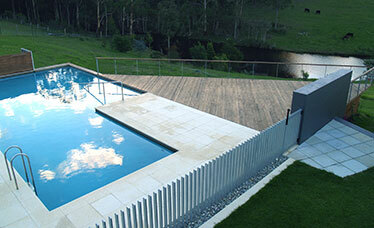 Galvanised steel blades rise up through river stones forming the barrier between house and pool.